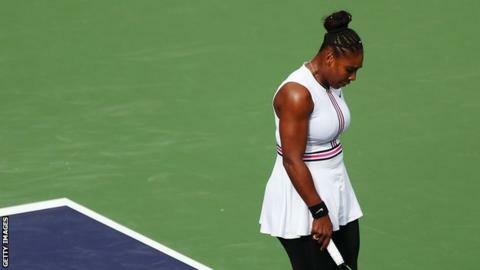 Serena Williams retired from her third-round match at Indian Wells while trailing Garbine Muguruza 6-3 1-0. The 37-year-old won the first three games of the match but called for the trainer after losing six in succession to the Spaniard. She took to the court for the second set, but retired after world number 20 Muguruza held in the opening game. Williams was seeded 10th in her first tournament since a quarter-final exit at the Australian Open. "Before the match I did not feel great and then it just got worse with every second - extreme dizziness and extreme fatigue," the American said. "By the score it might have looked like I started well, but I was not feeling at all well physically. I will focus on getting better and start preparing for Miami." Muguruza, who beat Williams in the 2016 French Open final, next faces seventh seed Kiki Bertens, who beat Britain's Johanna Konta. "We've played many times and it's always super-tough, super-exciting," said Muguruza, who is a former world number one like Williams. "I wish I'm going to see her soon and [she's] feeling better." World number two Simona Halep survived a strong challenge from qualifier Kateryna Kozlova to reach the fourth round. The Romanian, who won the title in 2015, struggled to hit her stride but emerged with a 7-6 (7-3) 7-5 victory in her first meeting with the 114th-ranked Ukrainian. Sixth seed Elina Svitolina of Ukraine beat Australian Daria Gavrilova 7-5 6-4 to advance, while there were also wins for China's Qiang Wang and Ashleigh Barty of Australia. In the men's competition, Roger Federer began his bid for a record sixth Indian Wells title with a 6-1 7-5 victory over German world number 85 Peter Gojowczyk to reach the third round. Federer, who won the tournament in 2017 but lost to Juan Martin del Potro in last year's final, was a break down at 3-1 in the second set. However, the Swiss world number four broke straight back, then benefited from a Gojowczyk double-fault for another break, before serving out for victory. "I struggled a little bit with my serving in that second set and that gave him chances. Because he was serving better, he started to swing more freely and then it was tough," said Federer. "I'm really happy I found a way in that second set." He will face compatriot Stan Wawrinka next, with the three-time Grand Slam champion unseeded as he continues his return from injury. The 33-year-old Swiss beat Hungarian Marton Fucsovics 6-4 6-7 (5-7) 7-5, finally sealing match point on his fifth attempt after three hours and 24 minutes. World number two Rafael Nadal, a three-time Indian Wells winner, needed just 72 minutes to get past American Jared Donaldson with a 6-1 6-1 victory to set up a meeting with Diego Schwartzman, who beat Spain's Roberto Carballes 6-3 6-1. "Today was a very positive step for me, and the next one is going to be against a player that we know each other very well - we practised a lot of times, and we played some tough matches," said Nadal. Japan's Kei Nishikori narrowly avoided a second-round defeat against Adrian Mannarino before battling through 6-4 4-6 7-6 (7-4). Mannarino served for the match at 6-5 but double-faulted on the third break-point he faced in the game and, in the deciding tie-break, Nishikori raced into a 6-2 lead. The Frenchman saved two match points before the Japanese finally wrapped up victory after two hours and 33 minutes. Meanwhile, there were also wins for eighth seed American John Isner, Guido Pella of Argentina, Croatia's Marin Cilic and Canadian Denis Shapovalov.